From the Cumberland Gap to the Atlantic Ocean, this is Virginia Water Radio for the week of September 30, 2013. This week, we feature a music selection with a title that honors the water-related origin and historic name of a Virginia Blue Ridge city. Have a listen for about 50 seconds. You’ve been listening to part of “Big Lick,” performed by the Celtibillies on their 2005 CD, “The Shoemaker’s Child,” on Zygoat Records. Group members Tim Sauls and Jack Hinshelwood developed this tune and named it to honor Roanoke, Virginia, which was called “Big Lick” in the 1800s. Now home to about 100,000 people and a center of transportation and commerce for southwestern Virginia, Roanoke began as a settlement near river-valley marshes that attracted buffalo, deer, and elk seeking water and natural salts dissolved in the water. Those watering spots, called “licks” at the time, in turn attracted Native Americans and then European settlers. Hundreds of years later, in an interesting water-history twist, current elk-restoration efforts that started in southwestern Virginia are being aided by construction of watering holes on lands formerly mined for coal. Thanks to Mr. Sauls and Mr. Hinshelwood for permission to use this week’s music. Elk in 2008, location not indicated. Photo by Robert Karges II, made available for public use by the U.S. Fish and Wildlife Service's National Digital Library, online at http://digitalmedia.fws.gov, accessed 9-30-13. Acknowledgments: “Big Lick” (part of the medley “Abe’s Retreat/Big Lick”) and “The Shoemaker’s Child” are copyright by The Celtibillies, used with permission. More information on The Celtibillies is available online at http://celtibillies.com/. Information on the City of Roanoke was taken from the Roanoke Valley Convention and Visitor’s Bureau, online at http://www.visitroanokeva.com/visitors/history/roanoke-history/; and from the U.S. Census Bureau’s “State and County Quick Facts,” online at http://quickfacts.census.gov/qfd/states/51/51770.html. 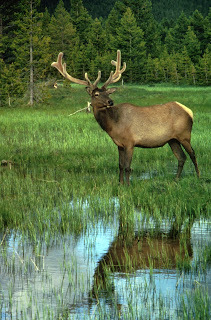 Information on modern-day watering-holes for elk in southwestern Virginia was taken from the Virginia Department of Game and Inland Fisheries’ (VDGIF) “Outdoors Report” of 9/25/13, online at http://www.dgif.virginia.gov/outdoor-report/2013/09/25/ (see the elk-restoration article in the “Wildlife Conservations Projects Update” section). More information on elk restoration in Virginia is available from VDGIF online at http://www.dgif.virginia.gov/wildlife/elk/management-plan/.